On Monday, September 24th, in New York City, LAL will host “Future Humanities: Translating World Literatures,” a public conversation on the stakes, challenges, and rewards of editing and translating premodern texts from the world’s great literary traditions. Andrew W. Mellon Foundation Vice President Mariët Westermann will moderate a panel of general editors from six groundbreaking publishing projects that specialize in facing-page translations. Topics of discussion will include the parameters and methodologies for establishing parallel-text translation series in Arabic, Chinese, Greek, Latin, Old English, and Sanskrit and other Indian languages. 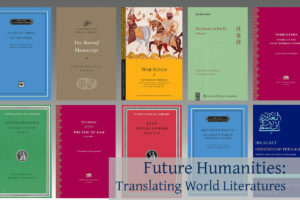 “Future Humanities: Translating World Literatures” is free and open to the public, and is organized in collaboration with NYU Press and the NYU Abu Dhabi Institute. For more information and to register, click here.